By the early 1900's, motorcycles had proven to be reliable sources of transportation and not just a novelty for the rich and eccentric. 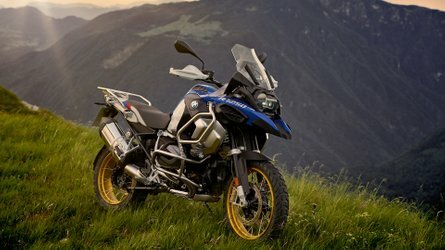 The first motorcycle manufacturers knew that in order to stay in business, they needed to capitalize on the commercial market instead of going solely after individual sales. Harley-Davidson was able to make its way into the commercial sector early on, landing its first commercial contract in 1908 with the Detroit Police Department. 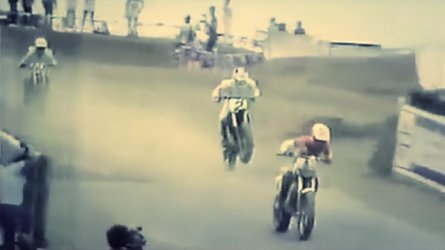 In that same year, Henry Ford began mass-producing the Model T, leaving motorcycle manufacturers struggling once again to find a foothold in the rapidly changing commercial market. One of the main advantages that automobiles held over the motorcycle was a relative abundance of cargo space, making them a logical choice for hauling loads and making deliveries. Over the next 25 years, Harley-Davidson engineers tackled this problem head-on, producing three distinct models focused on moving goods and equipment: the motorcycle truck, the package truck and the Servi-Car. 1913 motorcycle truck. Photo courtesy of the HD-Archives. In the fall of 1912, Harley-Davidson engineers were just finishing up a new prototype dubbed the "Motorcycle Truck". This machine featured a unique two-wheel front end with a cargo container nested between the front wheels To power the motorcycle truck, HD engineers turned to the the venerable V-twin motor, which had just undergone a major redesign the previous year. The V-twin was mated to a two-speed transmission which used a 5:1 ratio high gear and 10:1 ratio low gear. This new configuration allowed the motorcycle truck to haul 600 lbs of cargo in addition to a rider. Harley chose to test the motorcycle truck in the winter of 1912-13 with the Milwaukee branch of the US Postal Service. Harley had previously fostered a strong relationship with the USPS, as their motorcycles were often used by rural mail carriers to travel rugged routes around the country. After successfully making it through the harsh Milwaukee winter, the motorcycle truck was put into production for the 1913 model year. Touted as being easy to handle and highly maneuverable, the motorcycle truck enjoyed a short two-year production run before being replaced in 1915. 1929 Harley-Davidson J-series motorcycles with attached package trucks. Photo courtesy of the HD-Archives. Following on the heels of the motorcycle truck was a new cargo carrying motorcycle called the "Package Truck". 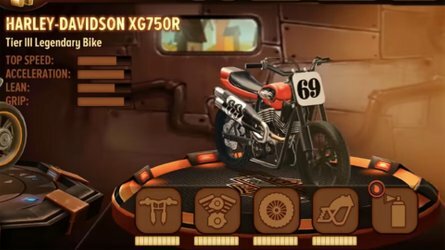 The name actually only refers to the cargo container which could be attached to a standard solo motorcycle just like a sidecar. In fact, the package truck was nothing more than a 1914 sidecar frame with a container bolted to it. This simple design created a new machine which had a similar payload to the motorcycle truck but was incredibly easy to manufacture. 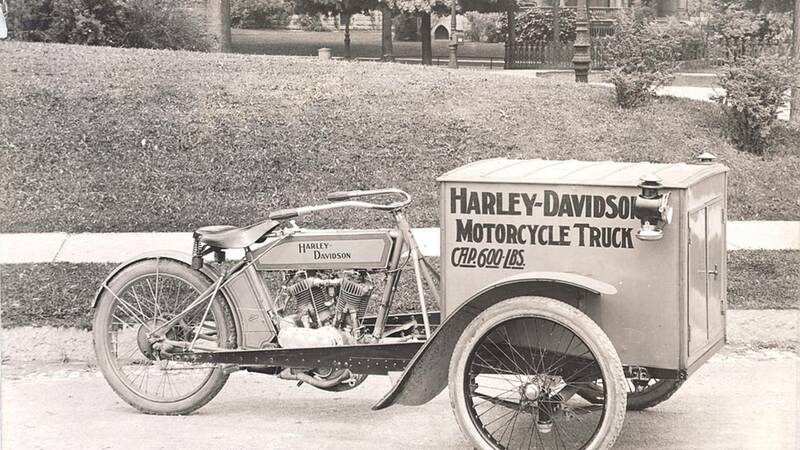 The package truck was also removable, a point that Harley's advertising department played up, marketing the idea of a dual-use machine which could run deliveries during the week and then be stripped down for solo excursions on the weekends. 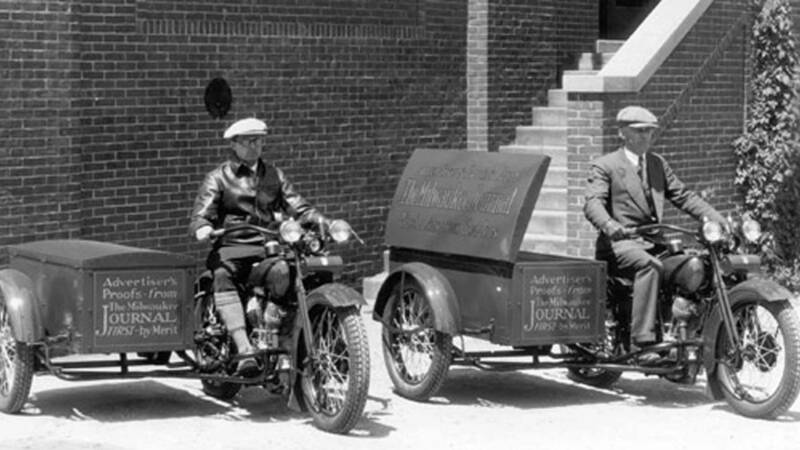 Starting in 1915, Harley-Davidson sold the package truck for between $70 and $72. Harley's previous experience with the motorcycle truck had taught them the value of using the cargo container for advertising, so they also provided custom lettering straight from the factory. 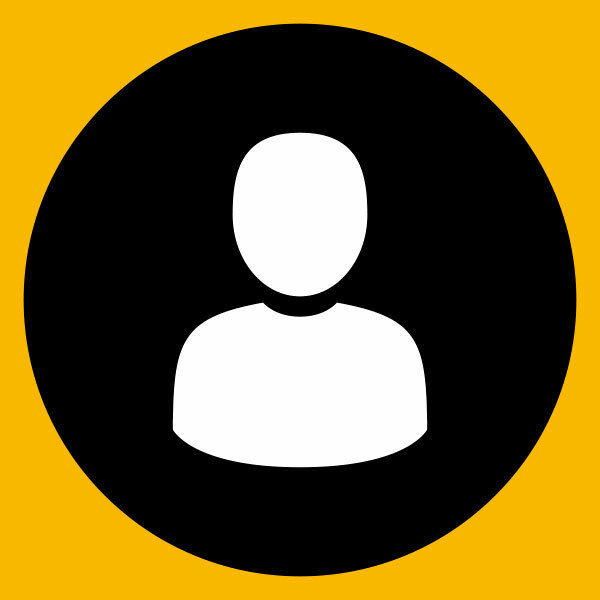 Many companies took this customization a step further, fabricating their own cargo containers or just replacing the bodies completely with new forms to catch the public's attention. Period photographs from the 1920's and 1930's document package trucks converted to everything from full-sized cows to giants shoes. Due to their ease of modification and affordability, the package truck had a very long production run lasting until 1957. 1932 Servi-Car used as a service vehicle for Chrysler automotive dealership. Photo courtesy of the HD-Archives. 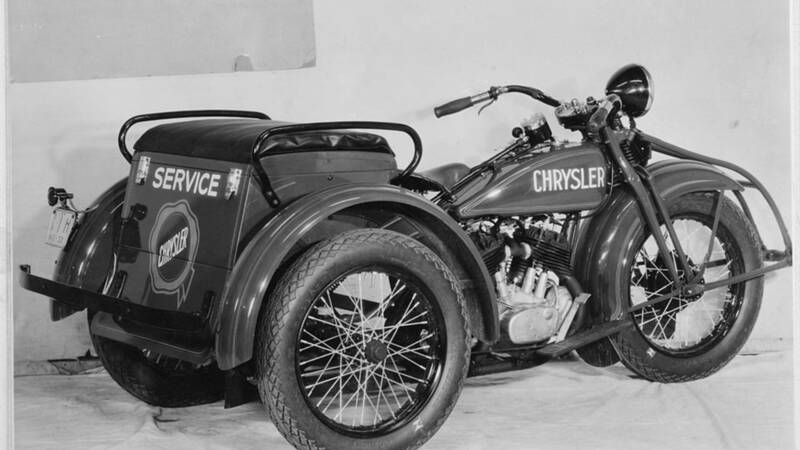 Harley's third and most successful commercial vehicle was the "Servi-Car". This three wheeled machine was first available in 1932 and like it's predecessors, was designed with hauling cargo and making deliveries in mind. Initially, the Servi-Car was powered by a low compression 45 cubic inch V-twin motor used in Harley's R-series solo motorcycles, but was soon updated to the W-series motor in 1936. This proved to be one of Harley's most reliable powerplants and was produced in huge numbers during WWII to power the WLA. The W-series was also a low compression 45 cubic inch V-twin, but unlike the R-series, it was designed with a recirculating oil system instead of the previously used total loss system which essentially pumped oil through the engine and then onto the ground. One the key reasons that the Servi-Car was popular with police departments, service stations and other delivery companies was it's ease of operation. 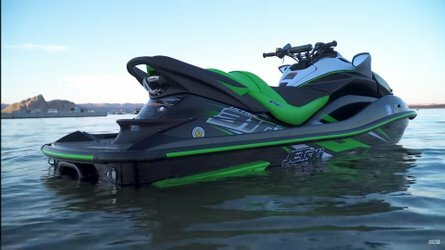 Unlike a solo motorcycle which takes no small amount of skill to ride, the Servi-Car could be driven by just about anyone who already knew how to drive an automobile. Similar to a car, the transmission was hand shifted and the clutch was foot operated. Of course there was no steering wheel, but the Servi-Car still had to be steered like a car since it was a three wheeler and did not lean like a solo motorcycle. The Servi-Car was also towable with an optional tow bar that could be clamped to the rear bumper of a car. Service stations took advantage of this capability, using the Servi-Car as a return vehicle when delivering repaired cars back to their customers. 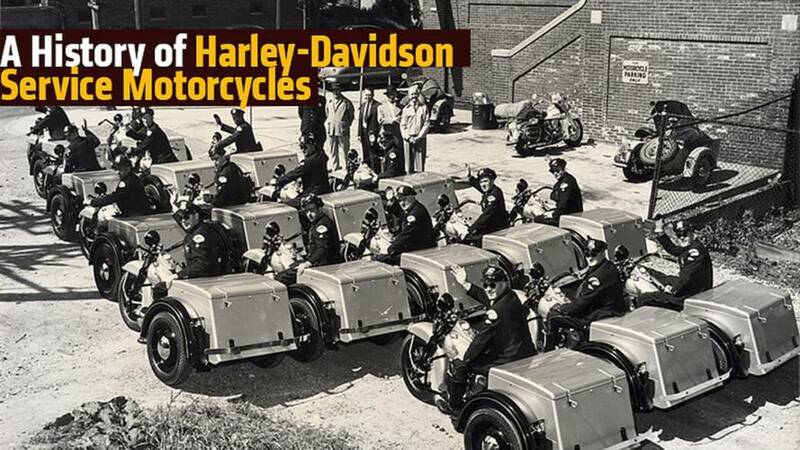 The Servi-Car had the longest production of any Harley-Davidson motorcycle, being continuously produced until 1973. 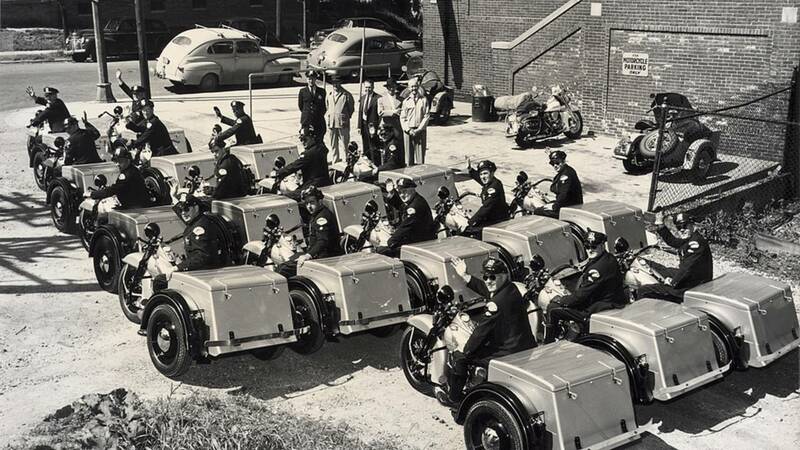 Chicago Police on their servi-cars in 1951. Photo courtesy of the HD-Archives.